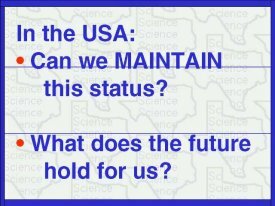 The big question on my mind and that of many of my colleagues is, "can we maintain our momentum"? I believe that we must look to science education in the lower grades to see where we are going. As responsible science teachers, we all should be aware of the importance to stay in tune with global competition in science. This is happening in business, so we should follow suit in the science arena.